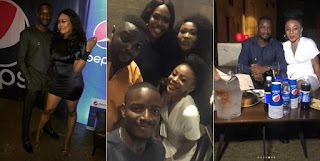 Former Big Brother Naija housemates LeoDasilva and his former strategic partner Ifu Ennada were presented their price for winning the Pepsi roc the mat challenge. Recall that some viewers of the show on Twitter, said they saw the eviction of Ifu Ennada coming because she lacks a strong fan base. Tebrina Nodra: This game is sooooooooo predictable. I already know the person going home and the winner, the 1st & 2nd runners up #bring back BBAfrica. Emmalex : Please where is Leo going to? Somebody tell him to come back here ooo He is going home today. Tracey_favor: I knew Lifu were goinh, Ifu ennada lacks fans, I mean she was too uptight. Twinkle : Tobi is safe…. oya lifu your time haff expire you got at least 2.5m plus more, can my miracle please sit. Andrex: Good luck Lifu, you have nothing to loose, you won Pepsi and heritage bank challenge already, use the money wisely. Lizzybeez : it’s clear nw..bye lifu.. IFu u were an amazing chic, salute Leo, Well run race. you will be missed. Femi Bakre : Omo if LIFU is announced safe, people will just faint. Grace breny: Ifu did well, I love her strength, she will go far in the entertainment industry.. Leo good luck with your business ideas. “So I heard the pair of Lifu were evicted from the house last night. Well it is nobody’s game. Lifu, Leo and Ifu, hi guys. “Welcome come home. Its not so bad out here. You gonna hear some crazy things on internet I wear to you. Like lots of madness on the internet. “When you get your phone, take a deep breath. What! The way we saw the house inside its not the way it is out here.